“WOW!” your friends exclaim, looking around your new home. Now, you COULD tell them the truth. You could unveil that you’re a full-time Internet writer. You stumble out of bed at 11am. You tap out a few words, finish off a few articles – all while still in your pyjamas. And then a couple of hours later, you go prepare yourself a leisurely lunch. But you don’t want to make your friends envious. So you might just want to invent something. Like you’re a stressed-out executive on minimum wage. Or you’ve just gone full-time at the Carphone Warehouse. Do NOT tell them the truth. A very warm welcome to this website – from Nick Daws and Ruth Barringham! Now, on this site, we’d like to share a real secret with you. A secret that could lead to your financial freedom – and perhaps the most enjoyable career you’ll ever experience. ... By WRITING for the INTERNET. Now, don’t throw that idea away immediately. You might think you already know everything there is about writing online. You might think it’s all just article writing and blog posts. But it’s not. Time to think again. We’ve both been earning tens of thousands online every single year – by tapping into some of the most EXCITING online writing projects you’ll ever encounter. But FIRST, who exactly are we? YES – we know the online writing world. YES – we know how you can earn $100,000 a year MINIMUM online. YES – we will make your friends jealous of your job. So, get ready... and READ ON! 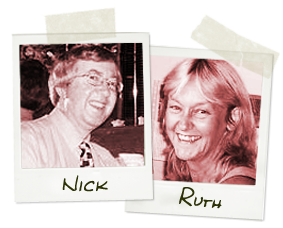 That’s why both of us – Nick and Ruth – have put together the Internet’s most COMPREHENSIVE GUIDE to making money as an online writer. So, would YOU like to tap into the world of online writing? Are YOU ready to begin making at least $100,000 a year – by tapping away on your keyboard? Remember, we’ll both show you PRECISELY how to get started as an online writer – and how to crack the BIGGEST, most profitable markets, starting IMMEDIATELY! And don’t worry if you have a “day job” elsewhere. You can always work as an online writer part-time, until you realize just how financially REWARDING it can be for you. Then throw in your towel – and join our online gang of wealthy writers! For example, do you know about the one big site ACTIVELY SEEKING writers right now – and paying them a MINIMUM of $725 for a few articles a month? Some of their most successful contributors are earning IN EXCESS OF $100,000 a year! Or how about the single trick that Nick Daws recently used to bring in MASSES of fresh online writing work? It cost Nick a grand total of $9 ... And brought in an extra $20,000 in work! That’s a return of over 200,000%! What about the new sites that pay YOU a percentage of advertising revenue – for each new article you submit to them? Or the often-misunderstood job auction sites that allow you to bid on THOUSANDS of new writing jobs – and the secret psychological tricks for ensuring you WIN every bid! Or what about the new breed of “ficblogs” that are helping online writers get their fiction work in print – and the publishing houses ACTIVELY SEEKING such bloggers! Or how about self-publishing your own e-book – and tapping into a very special army of 100,000 AFFILIATES that will promote it for you! We’ll show you how to practically force them into promoting you, with a very secret little trick. There are DOZENS of high-quality, online writing markets out there – which YOU can tap into, starting as early as TONIGHT. And they’re all inside our brand new guide: The Wealthy Writer. So, would YOU like to take a sneak peek inside The Wealthy Writer? Want to discover some of the FANTASTIC SECRETS in store for you – right now? Inside this 140+ page guide, you’ll find 11 POWERFUL modules, each covering some of the most important writing markets around. We’re talking over 80,000 words of the most meticulously researched and up-to-minute information currently available – from two of the Web’s most prestigious writers. Your TWO “BEST FRIENDS” as a Web writer - outside of Nick and Ruth! The THREE THINGS you MUST NEVER do when writing for the Internet! FIVE LITTLE WORDS you should ALWAYS keep in mind when writing website copy! Why KEYWORDS are really the “KEY” when you’re writing for the Web! How to develop your own “HOUSE STYLE” – and why this will make you an editor’s BEST FRIEND! Why absolutely EVERY writer needs their own website – and that includes you! The SEVEN BASIC ITEMS you must have on your site – and how they’ll SERIOUSLY benefit you! Our THREE LITTLE-KNOWN COMPANIES that will host your website, absolutely FREE of charge! THREE QUICK & EASY WAYS for getting your website to pay for itself – and even generate a BIG, FAT PROFIT for you! SEVEN GREAT WAYS to attract PAYING VISITORS to your website – all but one of these are free of charge! The ONE THING you MUST OFFER all your website visitors – to boost your readership and turbo-charge your writing profits! SIX LITTLE-KNOWN WEBSITES that will give you a SHARE of their advertising revenue – in exchange for each article you submit to them! An exciting SEVEN WAYS to find INCREDIBLY WELL-PAID WORK, writing articles and other content for online markets – starting TODAY! One BIG WEBSITE that is currently looking for new writers – paying a MINIMUM of $725 every single month, with some of the most successful authors earning over $100k a year, part-time! Where to grab the BIG LIST of 230 PAYING WRITERS MARKETS that accept e-mail submissions – print media included! Why “JOB AUCTION SITES” are often misunderstood – and why you absolutely MUST add them to your portfolio! The TOP EIGHT writing job auction sites – and the PROS and CONS of each! The TOP TWELVE TIPS for getting FANTASTICALLY WELL-PAID WORK from auction sites – and getting more of it, using these psychological tricks! Read the SAMPLE BIDS that WON the BEST WRITING PROJECTS – we give you the templates to tweak for yourself! The BEST FIVE “FREELANCE DATABASE” SITES – including one free site you absolutely MUST join! The SEVEN REASONS you absolutely MUST have a blog – in addition to a website! The new breed of “FICBLOGS” – and how to use them as a passport to getting your fiction book published! FIVE SAMPLE BLOGS that were picked up by publishers – and turned into best-selling books! PLUS – How to copy them! How to GET PAID ~$10 for EVERY BLOG POST you make – no joke! We give you the EXACT Web address to add to your Favorites list, TODAY! The EASY, SEVEN-STEP TECHNIQUE for getting your blog up-and-running in UNDER TEN MINUTES – and it won’t cost you a penny! TEN FANTASTIC METHODS for generating wonderful ideas for fresh blog posts – even when you’re fresh out of ideas! A LITTLE-KNOWN TRICK that absolutely ANYONE can use (unless you live alone, in the middle of a desert) – to create a POPULAR, MONEY-MAKING BLOG in double-quick time! THREE great ways to start earning money from your blog, THREE great ways to get more readers, and TEN TOP TIPS for keeping up your motivation! How writing E-BOOKS can ROCKET your Web writing income to STRATOSPHERIC LEVELS! SIX SMART REASONS for giving away FREE REPORTS – don’t worry, you’ll see an almost-immediate ten-fold return! The THREE CRUCIAL THINGS you MUST know before writing any short report or e-book! One FANTASTIC PIECE of SOFTWARE that will plan and outline your e-books and short reports for you! BEST NEWS – IT’S FREE! The SINGLE FORMAT you absolutely MUST create your e-book in – and how to get the RRP $299 software... FOR FREE! The INVALUABLE RESEARCH TOOL that will help you figure out EXACTLY how much to price your e-book! The EASIEST METHOD of selling your e-books WORLDWIDE – and it’ll only cost you $50 IN TOTAL! The SECRET METHOD of recruiting an ARMY of 100,000 affiliates – and PRECISELY how to get them on your side! How to make HUGE SUMS in the online world... by selling OTHER PEOPLE’S writing & products! FOUR AMAZING AFFILIATE NETWORKS that you should join today – and how to use them to rake in the cash! How to MOTIVATE visitors to click on your affiliate links – and generate FAT COMMISSIONS on every single purchase! How to DISGUISE your affiliate links for EVEN MORE PROFITS – here are the two services you can use, and why one is WAY better than the other! The “SUPER AFFILIATES” – and how people like “The First Lady” are making in excess of $50,000... EVERY MONTH... using the techniques we’ll show you! Uncover the sites which GOOGLE is paying Ruth THOUSANDS to run, each and every month – thanks to her articles! Ten AMAZING little niche writing markets – MOST of which you’ll NEVER have heard of! It’s YOUR guide to making $100k+ a year writing on the Internet. Are YOU ready to discover “The Wealthy Writer”? Remember, inside its pages you’ll find absolutely EVERYTHING you need to earn THOUSANDS writing for the Internet. From articles to e-books, affiliate marketing to blogging. You’ll uncover the SECRETS we’ve discovered that GUARANTEE you a fantastic career – all working from home, in your own time. And these secrets work for writers in the USA, in the UK, in Australia, in Europe – in fact, for writers ANYWHERE in the WORLD. We absolutely GUARANTEE IT – and remember that you’re dealing with two of the most prolific Web writers around. We’re not random, anonymous names. We’re genuine, respectable professionals with reputations in the industry. We would NEVER make a guarantee we didn’t back 100%. So, what would YOU pay to upgrade your career – and CHANGE your LIFE? APRIL BONUS: Buy the FULL COURSE TODAY for JUST $47!!! As part of our SPECIAL LAUNCH PROMOTION, you can buy THE WEALTHY WRITER today for JUST $47! This is the cheapest we will EVER offer this course – so take action NOW if you want to take advantage. There’s NEVER been a better time to buy this course –and there’s NEVER been a better time to become an online writer! So, take advantage. Click on THIS link to grab the entire guide – NOW! We want YOU to be a success online. Because then you’ll tell the world about “The Wealthy Writer.” You might even send us another unsolicited testimonial. And that ultimately means more sales for us. So, rest assured – we want you to SUCCEED. And that’s why both of us – Nick Daws and Ruth Barringham – want to give YOU a pile of BONUS goodies to ensure you REALLY hit the heights of online success! We’ve both gotten together to produce FOUR FANTASTIC BONUS REPORTS to help boost your income – and take you well over that $100k figure. Publishing service Lulu has made getting self-published a reality for everyone. In this guide, Nick Daws shows you how to create your own Lulu e-book – and get it out to the world, in under a day. Start earning royalties in absolute record time – with this bonus! So, you’ve written your e-book – and need to sell it on your site? Then you need a sales page. And they can be TOUGH to write! In this guide, Ruth Barringham shows you how to put together a killer sales letter – without the hassle! When you’re writing for the Web, you need people to STOP and LISTEN! This swipe file from Ruth Barringham gives you almost 400 words and phrases you can slot in ANYWHERE to ensure people sit up and take note. Great when you need a little inspiration! How to Make Big Bucks Selling Your Movie Idea to Hollywood! Can you imagine selling your movie idea to Tinsel Town – without writing a screenplay or even a treatment? Nick Daws shows you how to sell the “High Concept” – simple one-liners – and gives you the movie sites you need to get started! These are four BRILLIANT bonus guides – and they’re ALL YOURS, FREE, when you decide to grab YOUR copy of “The Wealthy Writer” – TODAY. Making that decision to try out this course will be the best career move you’ve made in YEARS. But we want you to feel ABSOLUTELY 1000% COMFORTABLE when you click that button to grab your copy. That’s why we’re giving you a 100% RISK-FREE GUARANTEE to boot! Both of us – Nick Daws and Ruth Barringham – absolutely GUARANTEE that you can use the secrets inside our guide to earn AT LEAST $100k a year as an online writer! All we ask is that you give the course a true evaluation, for three whole months. If you HAVEN’T made $25,000 from your online writing during those three months – LET US KNOW and we’ll refund EVERY SINGLE PENNY you paid. Or, if you’re just not THRILLED for ANY other reason whatsoever, again – just tell us – and we’ll refund everything. And we can make such a bold claim because we truly BELIEVE in this course. We’ve even had the guarantee underwritten by our sales processor, the Global Writing Network. All we ask is that you try it for three whole months. And that you let us know if you want a refund within four months. We’ll even let you keep the four bonus guides as a thank you for giving it a go. You absolutely CANNOT lose. Are YOU ready to earn $100,000 each year – as an ONLINE WRITER? YOUR copy of The Wealthy Writer course is already waiting for you – access details will be sent immediately after purchase. Over 140 pages of the greatest tips, tricks and techniques for earning BIG CASH using the Internet and your writing talents! Learn how to make a minimum of $100,000 a year as an online writer – by tapping into everything from article writing to affiliate marketing! Includes bonus resources, black book contacts, free software and MUCH MORE! Find out how to cash in on the e-book craze, and publish your own in absolute record-time! Discover the formula for convincing surfers to spend top $$ on your new e-book! Use this swipe file of 400 phrases for spicing up your articles and Web copy! Forget writing a screenplay! This guide shows how to sell an idea to Hollywood! We’ll provide you with the special contact details for getting in touch with our team, providing you with dedicated support whenever you need it. Whatever questions you have, we’re here to help! We guarantee you’ll earn AT LEAST $100,000 per year (pro rata). Try out the entire package for three months. We’ll refund EVERY PENNY if you don’t – or if you’re not THRILLED for any other reason! And you can keep the four bonus guides in thanks for giving it a go. 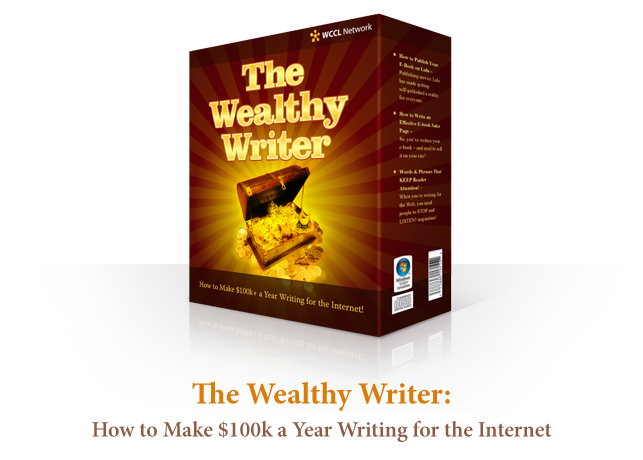 Now is the PERFECT TIME to grab your copy of The Wealthy Writer – and to find out how YOU can earn $100,000 a year MINIMUM, by writing for the Web. So, are YOU ready to make your friends ENVIOUS? Choose your own hours. Work from home. Enjoy a more leisurely lifestyle. Earn an EXECUTIVE SALARY – with the power of your words! It doesn’t matter where you live. Or what experience you have. Or what you think about writing for the Internet. All we can tell you is that we GUARANTEE you will turnover $100,000 a year MINIMUM – by following our techniques. Not only that, we know there are people out there RIGHT NOW absolutely BEGGING for your skills. So much so that you could begin working on a PAID JOB... Starting TONIGHT! Why not make the decision – and try it out for yourself? Discover the SECRETS we’d like to share with you. PS. The Wealthy Writer is ONLY available at this website! That’s right. You can’t purchase The Wealthy Writer at Amazon, on eBay, or anywhere else online. It’s EXCLUSIVE to this site. So if you’re even remotely interested, feel safe with our guarantee – and click here to grab YOUR copy, TODAY! PPS. There’s NEVER been a better time to try this course! This is literally the cheapest we’ve EVER offered the full package – and it simply doesn’t get any better. And there’s a STRONG CHANCE we’ll put the price up over the next couple of weeks. So, don’t delay. Take action NOW. Click HERE to grab your copy of The Wealthy Writer! PPPS. Remember, we GUARANTEE that you’ll earn $100,000! That’s our absolute 100% PROMISE to you. You’ll rake in AT LEAST $100k over the next year. And we even cover you with our three month risk-free trial. You CANNOT LOSE. Click HERE to get started – NOW! Earnings cannot be guaranteed. Results may not be typical.